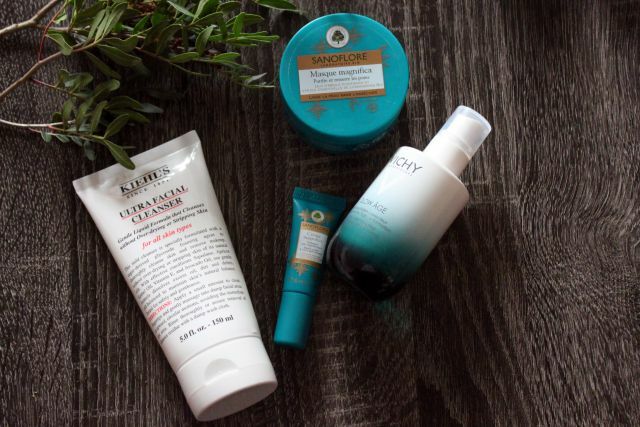 Even before I moved to Paris - where pretty much every woman's skin looks incredible, even with the sparse amounts of makeup they seem to use - I realised I had to develop some kind of skin care routine. While I've been pretty lucky with my skin (apart from the usual breakouts and such as a teenager), as I get closer to thirty (gulp) my skin is developing a range of special, oh so charming issues, like the random patches of dry skin in between my eyebrows and on my chin, wrinkles that appeared around my eyes overnight, and the occasional blind pimple that takes about a month to properly surface. I'm working on a big post about the skincare routine I've developed, but for now here's some products I've been trying in the warmer weather. Dryness was one of the biggest issues I had with my skin, and as if it wasn't bad enough that my skin felt like an old piece of bacon, it also had random patches of flaky skin, especially on my chin and between my eyes. This may have been due to the fact that I had barely (okay, never) used moisturiser regularly... somehow my skin was fine with that for 26 years until it just gave up sometime last year. 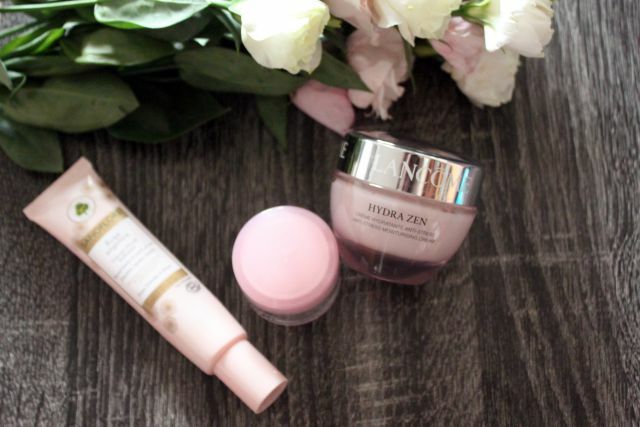 Anyway, since then I've been on the lookout for ultra-hydrating moisturisers and came across a few reviews of Lancôme Hydra Zen, and it sounded pretty great, despite the hefty price tag. But I think it was worth it because I absolutely love this moisturiser. It hasn't completely fixed the dry patches, but they've definitely improved. It felt instantly soothing when I applied it and it really felt like it quenched my skin, and the feeling lasts all day, which is a big plus. It has a little bit more of a gel consistency, rather than creamy, but doesn't feel greasy on the skin (a little bit goes a long way). It does have a mild rose scent but only on application - in a couple of minutes the smell has all but disappeared and I'm just left with smooth, soft skin. It's also plumped out a couple of fine lines I had between my eyebrows, which has been a much appreciated side effect! I bought the Hydra Zen gift box (I am an absolute sucker for a gift box because a. you get a couple more products for a dollar or two extra and b. treat yo self), so I also got to try a little pot of the Hydra Zen Creme Nuit. It's only a sample size but I felt like it was worth mentioning, because it feels pretty incredible too. It's less of a cream and more of a serum/mask hybrid, so if my skin needs some extra attention I pop this on before bed and leave it to work its magic overnight. I'm happy with it for now but still not completely convinced to pay for a full sized pot - it works really well with my moisturiser but doesn't feel very nice just on it's own, so I think I'm better suited to a night cream rather than a serum. The Sanoflore cream was what I was using before I got the Hydra Zen moisturiser. It's a perfectly pleasant moisturiser but not as hydrating as I would have liked. It's kind of like going on a date where there was nothing wrong with the guy but you can't describe him as anything other than "just... nice". It didn't absorb into the skin as quickly as I would have preferred and it felt like even the hazlenut-sized recommended amount wasn't really enough to get the dewy feeling I was looking for; however, this is recommended for normal to combination skin, rather than dry, which may have had something to do with it. It had a really gorgeous rose scent (not dissimilar to the Lancôme cream) which wasn't too overpowering, so hopefully I can find something else from the rose range that's a bit more suited to my skin - I've got my eye on the rose angelica concentrate! The Essence Merveilluise was the first Sanoflore product I tried, as a sample from Sephora ages ago, and I was so impressed with it that I bought the full size bottle before the sample was even finished (so, well played, person who chooses the Sephora samples). 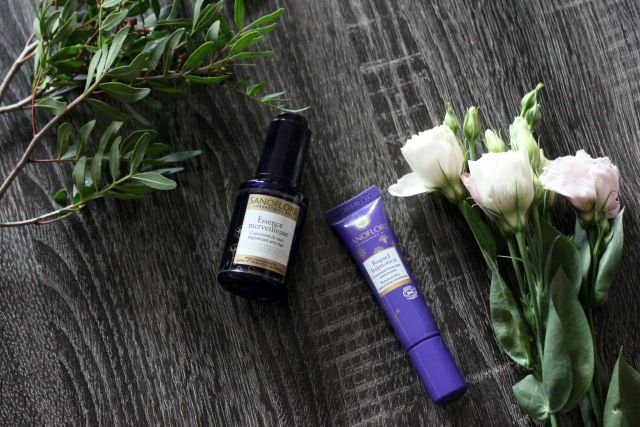 This was my first time using a face oil - I'd previously used this body oil and thought it was great - but I was pleasantly surprised that it absorbed into the skin very quickly and didn't make my skin feel greasy or, well, oily. I use it just before bed and while it does have a noticeable scent, it's quite pleasant and not too heavily perfumed. It had an immediate effect on making my skin feel softer, and I only needed a couple of drops to cover my face (although the stopper is a little bit annoying and obviously this wouldn't travel very well). I'm still barely a quarter of the way through the bottle even after a few months of use, but I'm not sure I'll be repurchasing - as much as I love it, I don't think it's hydrating enough for my skin. In the same line is the Regard Hypnotica eye cream. I've always been a bit skeptical of eye creams - like, what do they do that normal moisturiser can't? I had a sneaking suspicion that the reason they're included in so many beauty gift sets is that they just never work. I can't say I've noticed a huge difference after using this cream regularly, but the dark circles underneath my eyes do seem to have faded a little and the area seems brighter in general. If you're in the market for an eye cream then give this one a go! I've had a lot of trouble finding a cleanser, and it wasn't until I did a little bit of research and found that the cleanser/exfoliants I was using were way too harsh on my skin that I picked up the Kiehl's Ultra Facial Cleanser. I love Kiehl's body products but have never tried their skincare range, and I'm so glad I bought this cleanser. It's mild enough to use daily but still gives the squeaky-clean feeling after using, without making skin feel tight or uncomfortable and it is fantastic at getting all of the dirt and makeup off without 'stripping' the skin. I don't have to use much for my face to feel nice and soft afterwards, which I think makes it well worth the price. I don't love the texture - very goopy and thick - but it's such a small complaint compared to how effective it is. I bought the Masque Magnifica in my first big Sanoflore purchase - I hadn't read any reviews or anything about it, but saw on the label that it minimised pores so I was all over it. I was really impressed with this - you can notice the difference as soon as you wash the mask off (although it is a bit of an effort to get it all off and I'm inevitably left with little white patches on my jaw or near my ears!). It's not overly drying and it is AMAZING for getting rid of pimples really quickly! I wasn't so into the cream version, though (the sample size is shown above). While it promises to minimise pores and make skin smoother in four weeks, I didn't find it to be very moisturising so it felt kind of pointless using it. It didn't absorb well in my skin at all and would flake off if I tried to rub it in too much, so maybe it's better as more of a mask? Anyway, I didn't find it anywhere near as effective as the Masque Magnifica so I won't be purchasing it after the sample is used up. Unfortunately I also wasn't too impressed with the Vichy Slow Age Creme - I was actually really excited to try this one because the reviews were all stellar. However, it felt a little harsh on my skin - my eyes would water up when I used it and it would sting a little bit - and it had a really strong chemical scent that took a good couple of hours to go away, even under makeup. I do use the Vichy Aqualia Thermal moisturiser before bed and that one is much better on my skin. I wish I could have used it enough to judge whether it could make a difference, but I just couldn't get past the smell and so stopped using it after a week or so. 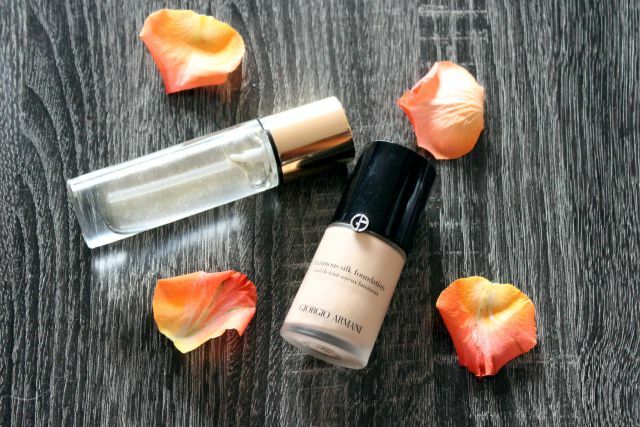 I was previously using the Armani Maestro foundation, and I loved it. It was light, not too sheer, and blended incredibly well. However, by the end of the day I wasn't getting the coverage I needed, and I wanted something that would still hold up after a day at work. The Luminous Silk foundation had great reviews, and I was so impressed by the Maestro foundation that I thought it made sense to give it a try. I have a couple of gripes with it - namely, it doesn't contain any SPF, which is not great, especially considering the price. I also found that it was a little more likely to settle into lines around my mouth and nose; nothing a quick buff doesn't fix, but still a little annoying to have to watch out for. However, it's not too heavy, gives amazing coverage (and only needs one pump of the bottle to cover everything), and looks good in photos (due to the lack of SPF, but still worth a mention!). I'm happy to use it for now, but I think I'll go back to the Maestro after I use up this bottle. I had a tube (bottle? Stick?) of Touche Eclat years and years ago, but I was never really sure how to use it; all I knew is that it was a "must have" item for your beauty bag... for some reason. Happily the primer is getting a lot more use! Like the foundation, one pump is definitely enough to cover the whole face and it melts into the skin, leaving a lovely, even surface for your makeup. Thankfully the glitter doesn't show up on the skin, so you don't need to worry about looking like you've slathered on the body glitter in preparation for the 2002 school disco. Not totally sold that it would necessarily be better than less expensive primers out there, though - I don't find any qualities that really justify the higher price tag (except for how nice the bottle looks, but... that's not really enough). Because this is the first Beauty Buys I've done, it's a little longer, but I hope you enjoyed it! 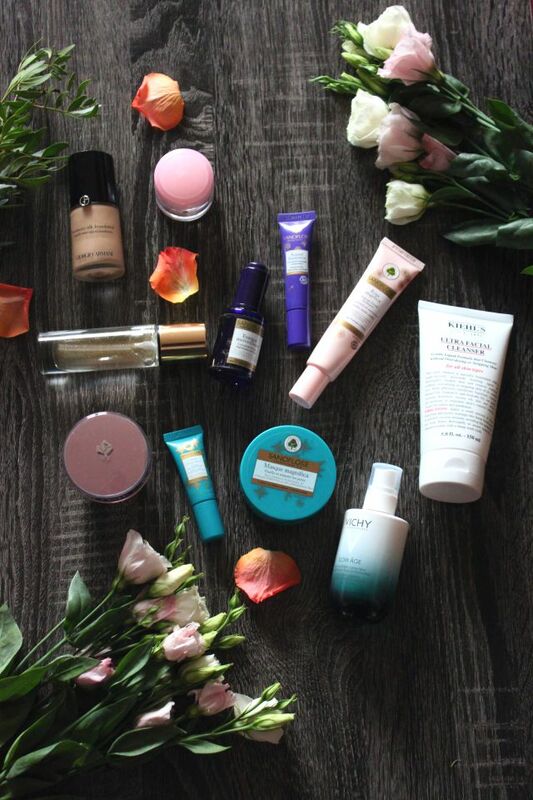 What beauty products have you been trying this spring? Five months ago I travelled to Europe for the first time in my life; the plan was to spend four days in Paris, ten days in London, and then home. A two week holiday turned into a three week holiday when I went back to Paris for another few days after meeting a boy... and soon after I got back to Australia, I decided to move to Paris for good. What started as "I wonder if I'm eligible for a UK passport" (I was) turned into "I wonder how easy it is to get an English-speaking job in Paris" (easier than I thought) which turned into "I wonder how long I have left on my lease" (not very long at all) which, six weeks later, turned into me saying goodbye to my mum and grandma at the airport and boarding the plane with a feeling of "I'm pretty sure this will all work out". So in August 2016, a week before I turned twenty-seven, I arrived at Charles de Gaulle (after a flight with a pretty hellish ten hour layover on top of the twenty four hour flight) with a new job, a new home, and two suitcases containing everything I thought important enough to bring to Paris (you know, things like a vintage 1940s dress - for all the fancy parties I would be invited to, obviously - but with the significant exclusion of any clothes suitable for temperatures under 20ºC, or basic necessities like shower gel and deodorant). Almost three months later I'm still finding my way - going from the world's most isolated capital city to Paris is a little bit of a shock to the senses - but so far moving was one of the best decisions I ever made. It hasn't all been been croissants and trips to the Louvre*; I still don't speak French anywhere near fluently, I work very long days, and trying to talk to family and friends regularly when there's a seven hour time difference can be really tough. But I'm very lucky because I have an apartment that feels like home, the world's cutest (and probably naughtiest) cat, and an incredible partner and new friends who have been so, so wonderful at helping me navigate my new home. So this blog is for me to remember my Parisian adventures. And of course, I needed a blog name that combined France and Australia, and what better way than with food? So, baguettes because I love them, and Vegemite because quite frankly I can't think of a better icon of good old 'Straya. *Okay, there have been a lot of croissants. Hello! I'm a 27 year old writer with a love for vintage fashion, burgers, and my cat Garbage. Follow my adventures from Perth to Paris!